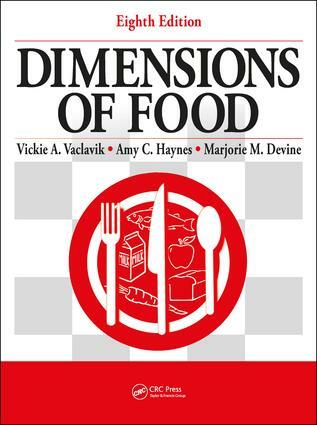 Following its bestselling predecessor, Dimensions of Food, Eighth Edition, provides beneficial classroom and independent, instructive material for students. Instructors will find that this textbook's organization makes it easy to use and very flexible for teaching. A variety of stimulating experiences allow the student to explore and comprehend the numerous dimensions of food. Part I of this lab manual contains an analysis of economic, nutritional, palatability, chemical, sanitary, and food processing dimensions of food. Part II allows students to analyze the structural and functional properties of foods such as starches, fruits and vegetables, eggs, dairy, meat, poultry and fish, fats and oils, sweeteners, and baked goods. Part III features information on microwave cooking, and Part IV concludes with beneficial ideas on meal planning. All chapters in this informative and interactive insight into food science contain learning objectives, exercises, recipes, summary questions, and updated Dietitian's Notes. Contains several helpful Appendices on topics including: Food Guides and Dietary Guidelines, Food Equivalents, Portions, Food Allergens, Food Additives, Legislation, Foodborne Illness, Cooking Terms, Herbs and Spices, and Plant Proteins.